Thanks to Dr. Ankur Sangoi, El Camino Hospital, California (USA), for contributing this case. To contribute a Case of the Week, follow the guidelines on our Case of the Week page. 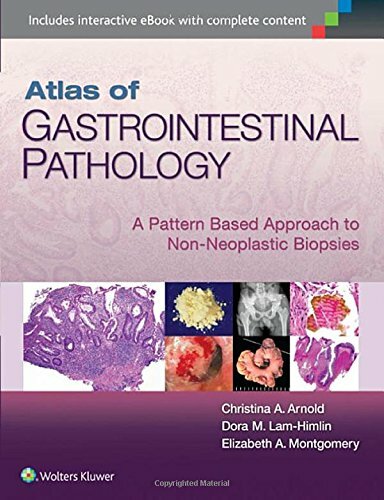 Arnold: Atlas of Gastrointestinal Pathology: A Pattern Based Approach to Non-Neoplastic Biopsies (2014). By Christina Arnold, Dora Lam-Himlin and Elizabeth Montgomery. 488 pages, 1,100 illus, $237 list. 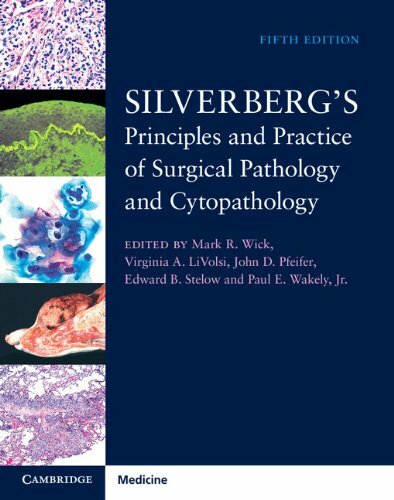 Silverberg's Principles and Practice of Surgical Pathology and Cytopathology (2015) by Mark R. Wick, Virginia A. LiVolsi, John D. Pfeifer, Edward B. Stelow and Paul E. Wakely Jr. 3664 pages, $517 list. (1) We now have the 2016 version of How to be a Lab Director on our website here. To buy the printed version for a nominal price from Amazon, click here. (2) We sometimes get asked why jobs remain posted on our Jobs page if a pathologist is told that it's filled. Read more to find out why. (3) Did you know that PathologyOutlines.com has information on new product and services, webinars and CME available for you to quickly and easily access? In the past month, we've posted a few New Product announcements and we have a large number of CME being offered by ASCP, ARUP and other organizations, and sorted by date posted and subspecialty. There are also upcoming webinars from ASCP and Leica Biosystems listed on our Webinars page, sorted by date, date posted and subspecialty. You can click on the links here or access the pages from our Home page. (4) To promote shopping at Amazon.com, particularly by going through our website, we have awarded Amazon gift cards of $100, $50 and $25 through a drawing of those who made purchases at Amazon.com in May or June 2015. Click here to see our winners! 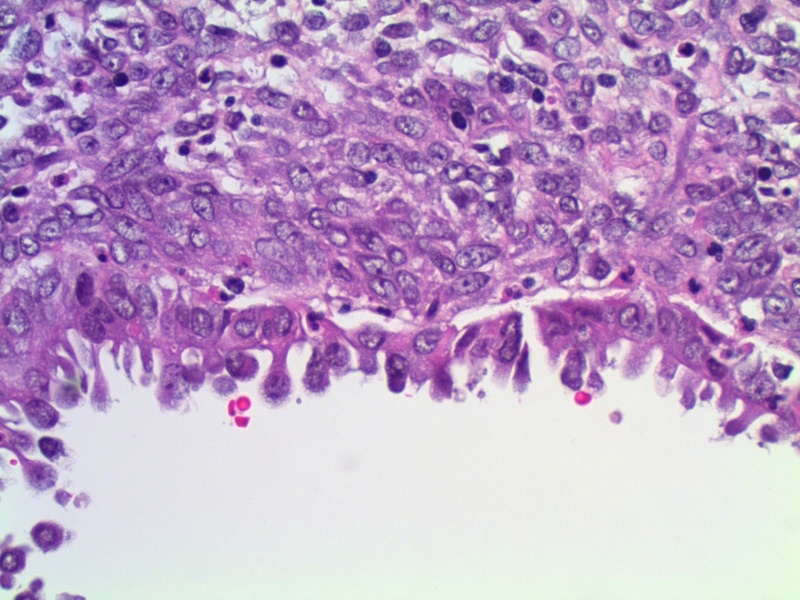 A 26 year old woman presented with a 4.0 cm renal mass. 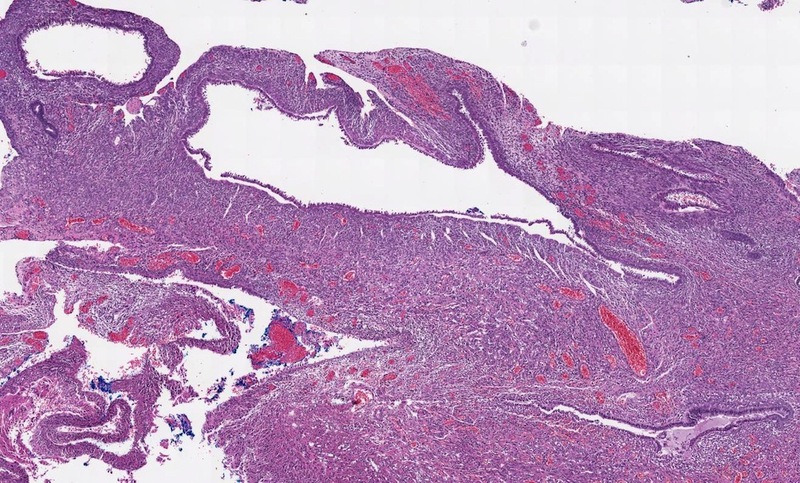 Angiomyolipoma/AML with epithelial cysts (AMLEC) (Am J Surg Pathol 2006;30:593, Mod Pathol 2006;19:669), is a rare variant of fat poor angiomyolipoma mimicking a malignant cystic mass on MR imaging (Diagn Interv Imaging 2015 Apr 23 [Epub ahead of print], Clin Radiol 2015;70:206). 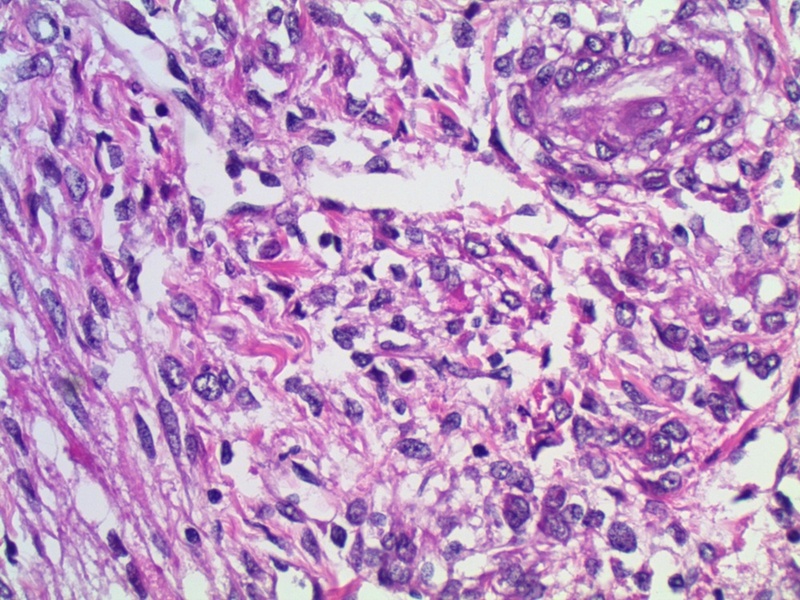 It is associated with tuberous sclerosis (Am J Surg Pathol 2009;33:289) and tuberous sclerosis-related renal cell carcinoma (Am J Surg Pathol 2014;38:1457). 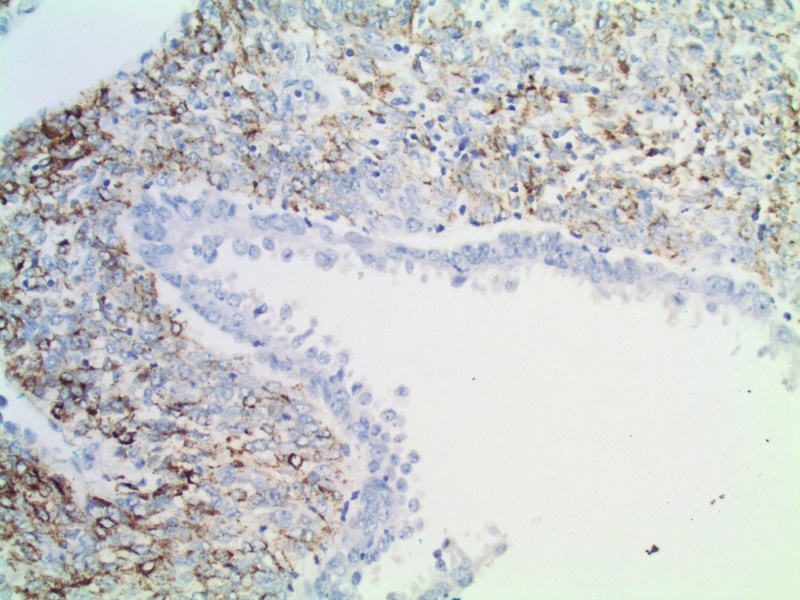 The diffuse labeling of the epithelial cysts with PAX2/PAX8, coupled with their consistent negativity for estrogen receptor and HMB45 suggests that this epithelium represents entrapped cystically dilated renal tubules that herniate beyond the renal capsule (Am J Surg Pathol 2011;35:1264, Pathol Int 2008;58:664). 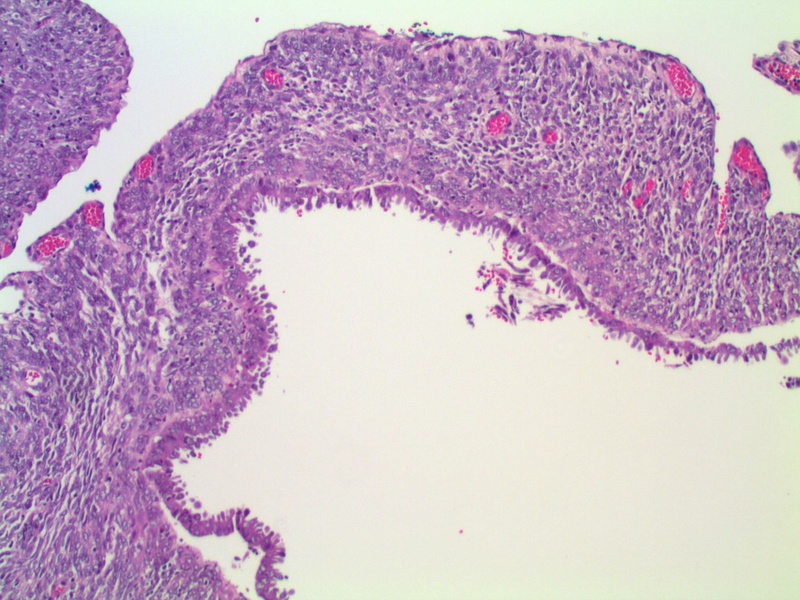 Histology shows three components: (a) epithelial cysts lined by cuboidal to hobnail cells; (b) compact subepithelial Müllerian-like AML stroma with admixed chronic inflammation and (c) muscle predominant AML with dysmorphic blood vessels exterior to the subepithelial stroma (Diagn Pathol 2007;2:11). 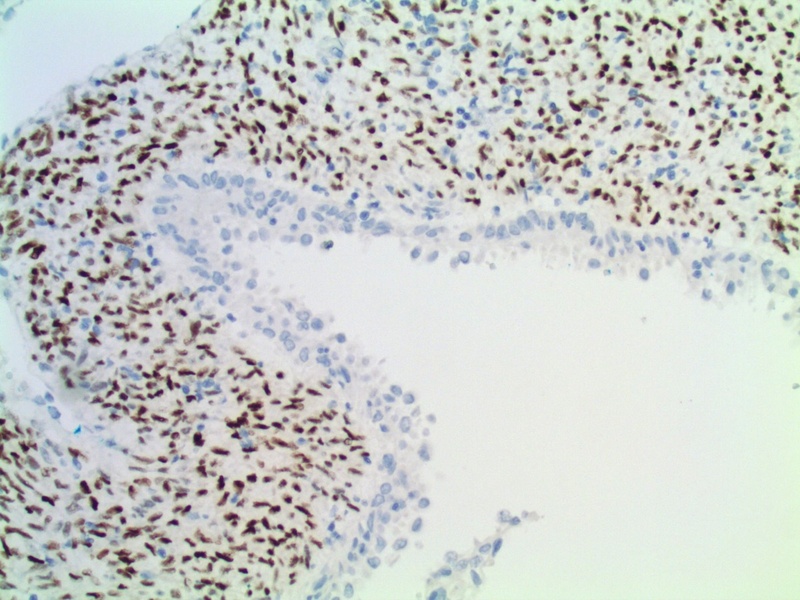 Immunostains show that the subepithelial stroma stains most intensely with HMB45 and MelanA, as well as ER, PR and CD10. 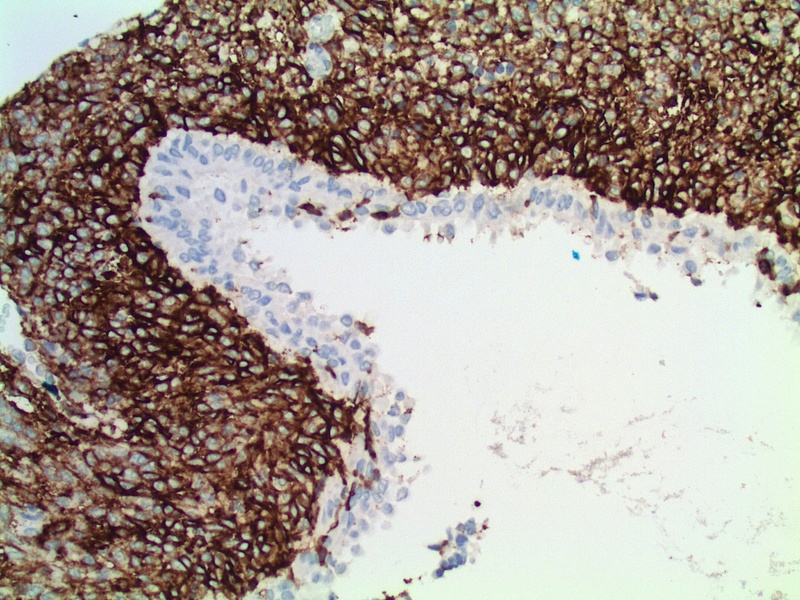 The muscle predominant AML areas stain most intensely with smooth muscle actin and desmin. 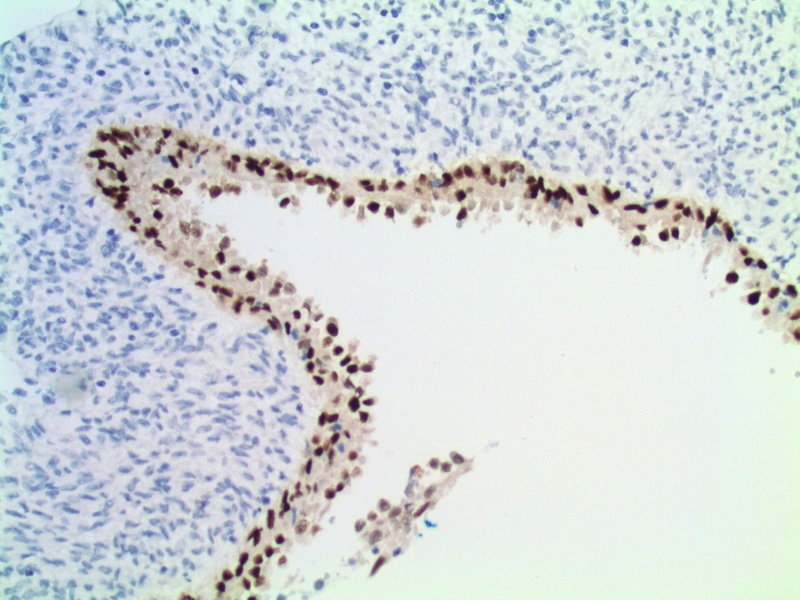 The cyst lining stains for pancytokeratin, but is negative for HMB45, MelanA, ER, PR and CD10. 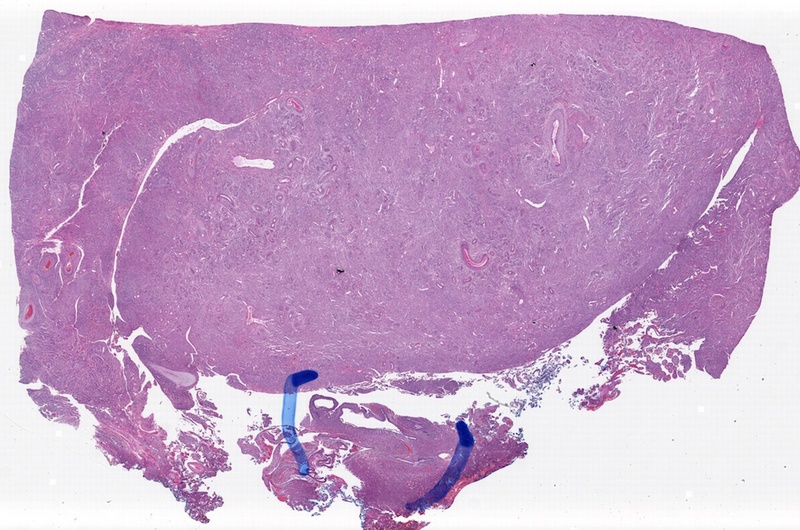 The differential diagnosis includes mixed epithelial stromal tumor / MEST. However, MEST occurs almost exclusively occurs in perimenopausal women with obesity or receiving exogenous hormones, or men treated with lupron or DES. 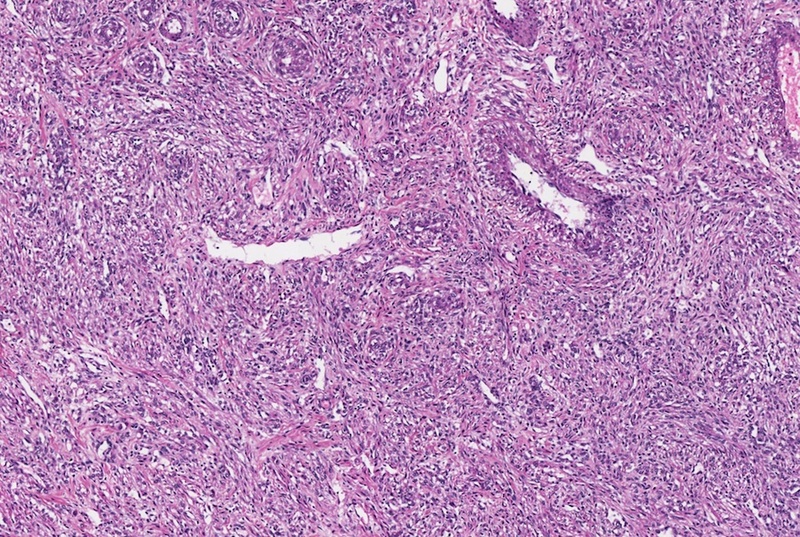 It lacks the distinctive dysplastic blood vessels and disorganized exterior muscular layer of AML, and has a different immunohistochemical profile. AMLEC typically has benign behavior.